The 40 metre motor yacht Seaflower, listed for sale by Jonathan Zwaans at Y.CO, has been sold with Nautique Yachting and Gaston Lees-Buckley at Camper & Nicholsons acting for the buyer. 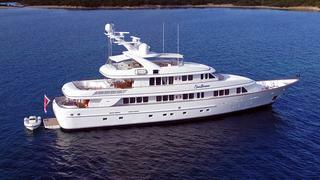 Offering all the amenities of a much larger yacht, Seaflower has five cabins for 10 guests. These include an owner’s suite on the main deck while below there is a VIP suite, a double and two twin cabins, all with full en suite bathrooms. Crew quarters have berths for seven crew in four cabins. The saloon is suitably gracious with comfortable seating on three settees and occasional chairs while the dining area seats 10 guests for formal dining on custom made chairs, new in 2015. More informal dining is available on the aft deck with seating for eight guests. Deck areas are fantastic and include numerous spaces for relaxation, including a large sun deck which comes with a pizza oven, wet bar, fridge and ice maker. Twin 624hp Caterpillar engines give her a cruising speed of 12 knots and she is fitted with zero speed stabilizers. Lying in Monaco, Seaflower was asking €11.9 million.